Perhaps all of the earlier leaks have yet to convince you that Google is going to release a mid-range version of the Pixel 3 line this year. Even the news we told you yesterday about the two new Google phones being added to the Google Play Developer Console's Device Catalog might not have persuaded you. By the way, we could tell that the pair of handsets were Google phones because their code-names were both the name of fish, "bonito" and "sargo." You might say that Google has an af-fin-ity for using the name of fish as code-names for its own products, but only if you're the type that likes to pass along bad puns. Ok, we understand your reluctance to think of last night's news as being definitive. After all, the actual names of the new models were not used in the Device Catalog. But now, we believe that a mistake made by Google itself will persuade you that the mid-range Pixels are real. According to Android Police, the Pixel 3a name was accidentally (and prematurely) posted in the online Google Store not just once, but twice yesterday. The first appearance was under the "Phone" heading. With the Pixel 2 range no longer offered for sale by the Google Store, what was listed under that heading was the Pixel 3 and the Pixel 3a. And just in case you don't religiously follow the smartphone industry, the word "NEW" in blue capital letters followed the Pixel 3a listing. The second appearance was under the heading "Featured Accessories" where a listing for Pixel 3a cases could be found. Neither link is functioning at the moment, but they do seem to indicate that the mid-rangers will be unveiled soon. We could see the Pixel 3a and Pixel 3a XL introduced during next month's Google I/O developer conference and launched the following month. Specs leaked last month remain mostly unconfirmed but point to a 5.6-inch screen for the Pixel 3a with a resolution of 1080 × 2220. That means that the aspect ratio will be 18.5:9. The Snapdragon 670 Mobile Platform will be under the hood, and despite earlier reports, you'll find 4GB of memory inside the device. The phone includes 64GB of non-expandable storage. Keeping the lights on will be a 3000mAh battery and Android 9 Pie will be pre-installed. The Pixel 3a XL will reportedly carry a 6-inch screen with a 1080 x 2160 resolution. That works out to an aspect ratio of 18:9. The Snapdragon 710 Mobile Platform will drive the device, which will feature 4GB of memory and 64GB of non-expandable storage. The battery capacity is unknown, and Android 9 Pie will be pre-installed. Yesterday, we told you that both models will be equipped with the Pixel Visual Core image processing unit (IPU), which debuted with the Pixel 2 and Pixel 2 XL. On the latter two models, the IPU is used mostly to process for the HDR+ photos. This is the feature that takes parts from multiple exposures of the same shot to create one outstanding photograph. On the Pixel 3 line (and presumably the Pixel 3a models), the Visual Core co-processor is used for new photography features like Top Shot and Photobooth. The rear camera on the Pixel 3a and Pixel 3a XL will employ the same 12.2MP sensor found on the Pixel 3 and Pixel 3 XL. But the new mid-range models will have only one selfie snapper in front, an 8MP camera. The front-facing wide-angle sensor is MIA on the Pixel 3a and 3a XL. 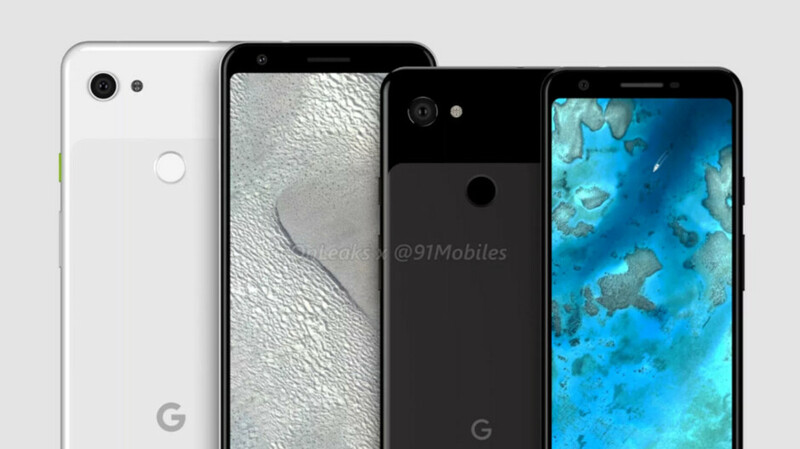 Now that Google itself has leaked the upcoming Pixel 3a and Pixel 3a XL, you can be assured that the first mid-range Pixels are actually coming to market sooner than later. The phones are expected to be Verizon exclusives, although they should be compatible with all four major U.S. carriers. Both models will most likely be available from retailers like Best Buy, and the online Google Store. Last week Google accidentally leaked a new smart display in the Google Store. Called the Nest Hub Max, this device will include a security camera and a 10-inch HD (720p) display. I agree. I really want it to have 6GB of RAM, but with the 710, it should be as smooth as butter. I completely agree. I'd like that 710 to be used in the smaller model too and I'd also like Google to have used an Oled panel as well. Lol, if I keep adding things to my wish list for this device then it will probably become the flagship model - sans the top soc and screen notch... The onus here will be for Google to give it a true mid-range price tag. But I'm not going to hold my breath for that. Hehe, how come always Xiaomi, Huawei, Google show something coming by accident? Don't consider people to be idiots please. It is a pure marketing strategy, not an incident. All manufacturers did that, remember IPhone 11 back panel? with lots of holes that leaked recently? Yes, all these leaks are on purpose for any brand. I just wonder if authors in phonearena and gsmarena think their reader are idiots with posting article titles like that. Price it right and take my money. Looks like Nokia has some steep competition and they have waited too long to get a firm foothold in the US. Still Google is going to have to convince me to part with my 7.1 if they want me to cop that jawn. looks like my iphone 6s, why would i buy this phone??? It doesn't looks like 6S anyday. Exactly! Made out of plastic and it doesn't even offer the dual speaker, which is signature to the regular Pixel 3. There're an immeasurable amount of midrangers that are made of aluminum, or have a crystal back and support wireless charging, and have far better specs. Google needs to get their s**t together tbh. $400 USD for the smaller model. Take it or leave it. mmm it's just me or this year Google did the worst design on all of their phones :(, could someone tell me the statistics of its selling?